The Asus ZenWatch was one of my favorite first-gen Wear devices, but I wasn't quite as smitten with the aggressively priced ZenWatch 2. It was like a cheaper, clunkier version of the first watch. The upcoming ZenWatch 3 might be a departure from Asus' square design. Ausdroid has spotted an FCC filing for the ZenWatch 3, which doesn't usually contain much useful information. 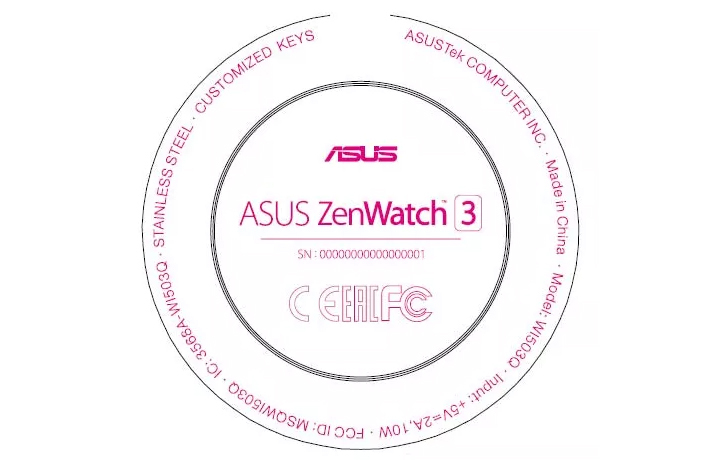 This time, the label seems to have outed the ZenWatch 3 as a round device. Companies usually request confidentiality when submitting a device for regulatory certification. Thus, we don't have photos of the device. The design for the label is round, though. That means the device and the display are probably round as well. The label lists model number WI503Q and says that the smartwatch will have a stainless steel frame and "customized keys," whatever that means. The ZenWatch 3 branding is also prominently displayed. The filing notes that the ZenWatch 3 will have WiFi b/g/n, Bluetooth 4.2, and a 5V 2A charger. That's probably all we'll know until the device in unveiled. The upcoming IFA conference in Berlin would be a good place to show off a new ZenWatch—that's where the ZenWatch 2 was announced last year.